Now that we have a Table View set up in Interface Builder, we need to tell it how to behave. The Table View has a custom Cell, but it doesn’t know how many cells to show or what content to put in those cells. // but you can go ahead and delete it if you want. You should start seeing some compile errors because ViewController does not conform to the protocol yet. We need to implement the protocol’s required methods. How many rows do we want? One of the protocol’s required methods is tableView(_, numberOfRowsInSection). Before we can tell the table views how many rows it should have, we need to decide that for ourselves. It’s pretty typical to back a Table View by a data structure like an Array or a Dictionary. A Dictionary makes sense in this context, because we can use the person’s name and their current score as the key/value pair. Most declarations in Swift are written with the let keyword. This means they’re immutable and can never change once initialized. This allows for some great compiler optimizations, but isn’t always what we want. Later, we’ll be mutating the scores dictionary by incrementing and decrementing people’s score values. We want to use a var declaration so that the dictionary will be mutable, or capable of changing. The Table View knows how many rows it should have, but it still needs to know what those individual rows are. In our case, we want all of the rows to be the score cell that we made in Interface Builder, but you could set it up so every row was a different type of cell. The tableView(_, cellForRowAt indexPath) method is supposed to return an instance of UITableViewCell. We want to create an instance of the cell we designed earlier, so we need to dequeue a reusable cell with the score identifier. Imagine quickly scrolling through a table view that has 1000 rows. 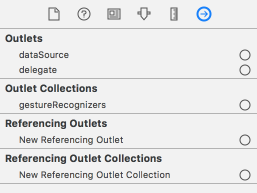 If the table view had to initialize a new UITableViewCell every time a new one came on screen, it would spend a lot of processing time on allocating and deallocating memory for these temporary objects. Extra processing time is the enemy of smooth performance, and those wasted CPU cycles would start causing noticeable stuttering. 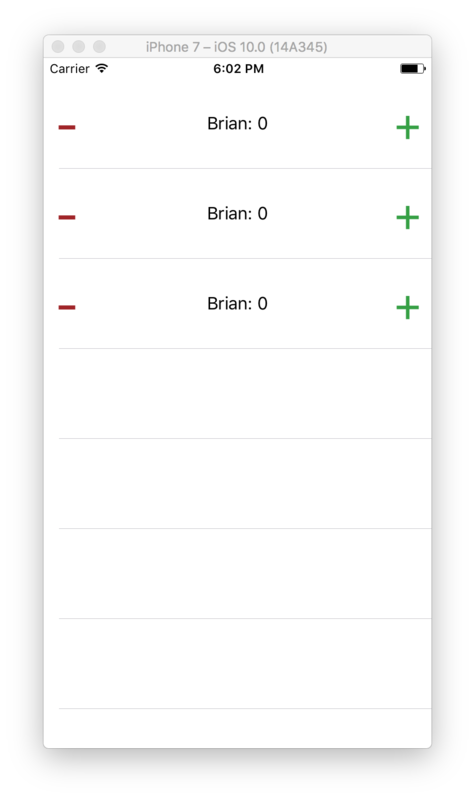 Instead, UITableView keeps a queue of cells that have already been initialized. When you call dequeueReusableCell, the Table View checks its queue. If it has extra cells that have moved off-screen, it reuses those cells. It only initializes a new object if absolutely necessary. 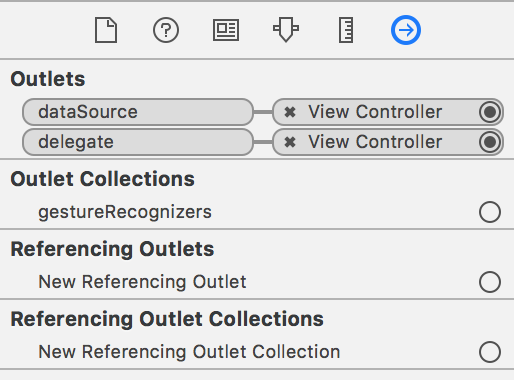 Even though we’ve turned our ViewController into a UITableViewDelegate and UITableViewDataSource, we haven’t told the Table View to use that controller as its delegate. We need to connect the View Controller to these outlets. You can do that by dragging from the circles on the right to the little yellow circle at the top of the canvas. The Table View is loading some score cells and displaying them, but we aren’t telling it how to render the cell. Right now it’s just displaying whatever we have in Interface Builder. We want to populate each row with a different person from the scores dictionary, but that’ll take a little more work. We implemented our UITableViewDelegate / UITableViewDataSource. We covered UITableView’s optimization strategy and got our custom Cell to start appearing on screen. We’ll implement a custom class that subclasses UITableViewCell, allowing us to customize the content in each individual row.